Image caption Tha Wind Energy son 34 crainn a thogail air Oighreachd Cille Mhuire is Gleann Chailbhidh. Tha an caothach air luchd-iomairt ann an Cataibh is oifigearan dealbhachaidh a' moladh nach cuir Comhairle na Gàidhealtachd an aghaidh tuath-ghaoithe faisg air Àird Ghaoithe. Chuir a' chompanaidh Wind Energy plana air adhart son leasachadh air Oighreachd Chille Mhuire is Gleann Chailbhidh. Dh'iarr iad an toiseach gum biodh 43 crainn ann ach chaidh sin a lùghdachadh gu 34. Bhon uair sin tha SEPA is SNH air na gearainean a bh' aca mun phlana a tharraing. Chuir ge-tà, còrr is 121 neach fios air Comhairle na Gàidhealtachd 'son cur na aghaidh. Fhuair Comhairle na Gàidhealtachd aon litir a bha a' cur taic ris an leasachadh. Fhuair Riaghaltas na h-Alba 209 freagairt an aghaidh a' phlana is 32 a bha taiceil. "Tha uabhas oirrn an seo," thuirt Iain Edmondson bhon bhuidhinn strì Save Our Straths. "Bidh sinn air ar cuairteachadh an seo le crainn-gaoithe. "Tha mar thà 60 no 70 ann - sin a dhà uidhir 's a th' ann an Gallaibh - is a-nise tha iad a' beachdachadh air 34 a bharrachd. "Cha creid mise gu bheil iad air sgrùdadh dòigheil a dhèanamh air a' bhuaidh aige sin air fad air a' choimhearsnachd an seo," thuirt e.
Thug Sreap Alba (MCofS) slaic air na molaidhean cuideachd. "'S e leasachadh a tha seo ann an sgìre a tha anabarrach breagha," thuirt àrd-stiùiriche na buidhne, Dàibhidh Gibson. "Tha sinne airson 's nach tèid tuathan-gaoithe sam bith a thogail ann am beanntan na h-Alba gus an tèid poileasaidh dealbhachaidh nàiseanta a stèidheachadh mun ghnothach. "Tha sinn taiceil ri tuathan-gaoithe is cumhachd ath-nuadhachail - ach feumar beanntan na h-Alba a dhìon cuideachd," thuirt e.
Ann an aithisg a thèid air beulaibh chomhairlichean Dimàirt, tha oifigearan air moladh gun a bhith a' cur an aghaidh a' phlana, ach gun tèid an gnothach fhàgail ann an làmhan Riaghaltas na h-Alba. Ged a ghabh oifigearan ris an argamaid gum biodh buaidh air coltas an àite, fhuair iad gum biodh barrachd bhuannachdan ann le bhith a' toirt airgid is chosnaidhean dhan sgìre. 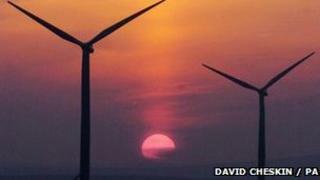 Thuirt Wind Energy gun tèid obraichean a chruthachadh agus gun tig £8m dhan eaconamaidh ionadail. Thuirt iad cuideachd gun tigeadh cumhachd gu leòr às an leasachadh son dealan a chumail ri 90,000 taigh, agus gum biodh e na phàirt cudromach den oidhirp gus targaidean na h-Alba a thaobh chumhachd ath-nuadhachail a ruighinn.